World of Warcraft Gold Guide - How To Make Gold in WOW: Loot Hunter Treasure Hunting Guide is now FREE! Loot Hunter Treasure Hunting Guide is now FREE! If you haven't obtained the Loot Hunter guide yet, you should check it out, as there's a completely free version of it available. No download required! But like always, free versions have their downsides. These are usually limited trial offers or advertisements, but there are no time restrictions this time. Access to it works similarly to the Elite Gold Making page here. To learn more, enter the Loot Hunter. Loot Hunter is a treasure hunting guide for World of Warcraft. It provides you with maps for each zone. These maps have locations for all points of interest, such as treasure chests and rare monsters. Why would that interest me? All points of interest that are listed in the guide will award you with phat lewts and yummy experience. 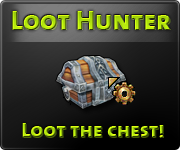 If you are bored of questing, give loot hunting a go! It's in website format now, but in the future it may be available as an addon. Because this is the first day it's free, if you have any suggestions or other ideas on how to make your reading experience more pleasant, use the contact form found on the main page of the guide.